The great white pelican is a huge bird, with only the Dalmatian pelican averaging larger amongst the pelicans. The wingspan can range from 226 to 360 cm (7.41 to 11.81 ft), with the latter measurement the largest recorded among extant flying animals outside of the great albatrosses. Great white pelicans are usually birds found in and around shallow, (seasonally or tropical) warm fresh water. Well scattered groups of breeding pelicans occur through Eurasia from the eastern Mediterranean to Vietnam. 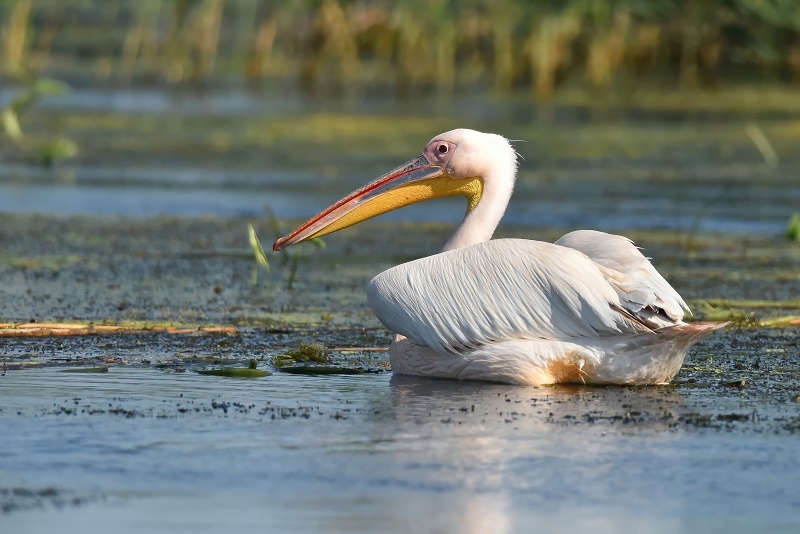 In Eurasia, fresh or brackish waters may be inhabited and the pelicans may be found in lakes, deltas, lagoons and marshes, usually with dense reed beds nearby for nesting purposes. The diet of the great white pelican consists mainly of fish. The pelicans leave their roost to feed early in the mornings and may fly over 100 km (62 mi) in search of food, as has been observed in Chad and Mogode, Cameroon. Pelicans are not restricted to fish, however, and are often opportunistic foragers. In some situations they eat chicks of other birds, such as the well documented case off the southwest coast of South Africa. Very good picture of this Pelicano. With an excellent composition and with a excellent low point of view. How much I love the sea river and lakes, living here in the desert there it attracts me much, excellent. Fantastic entry here my old friend Marius. Hope You are well ! Beautiful picture, no doubt. Like exposure, low POV and details.